Tesla has shown the whole world that electric cars can be far better than conventional fuel cars and can surely be the way forward in transportation. 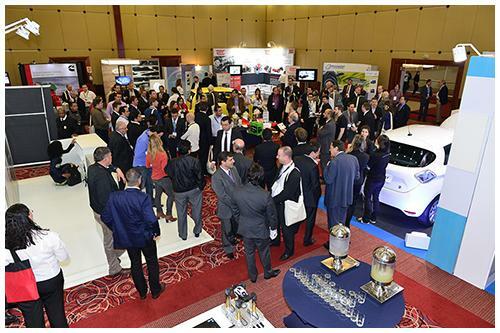 Norway has shown us that with government incentives, public sensitization for EVs and great products, electric cars can outsell petrol and diesel cars. Now it is time for India to step up and support the existing small scale electric vehicle (EV) market to make it larger in the coming years. There is a lot of scope for expansion of EV mobility in India, especially the charging infrastructure. The Government of India has started Faster Adoption and Manufacturing of Hybrid and Electric Vehicles (FAME) scheme which provides incentives for purchasing EVs. 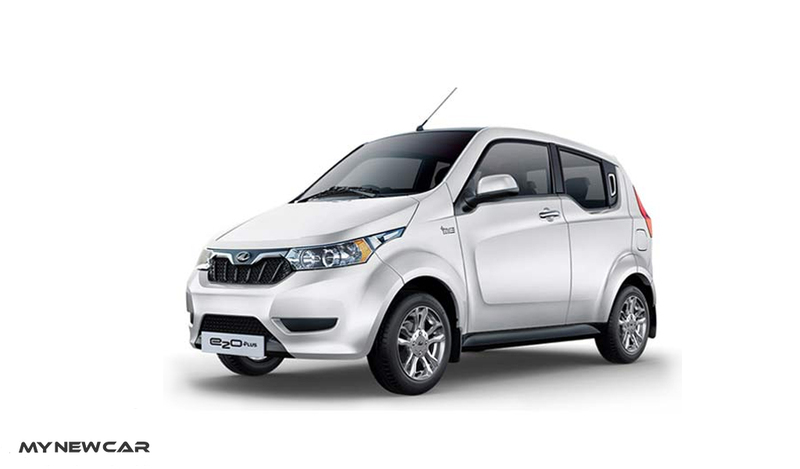 At present, e2oPlus is one of the very few fully electric cars in India. 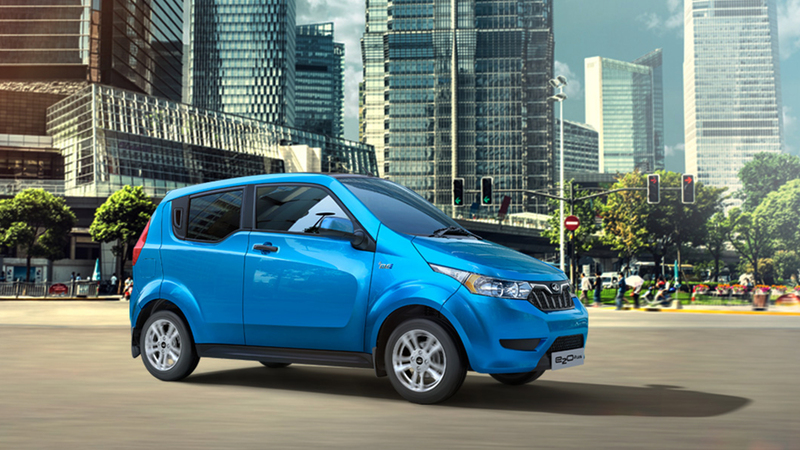 Launched by a highly focused homegrown EV player, Mahindra, e2oPlus is one among the large portfolio of the company’s EVs. If you are really worried about rising pollution levels, then you don’t have many options in India than to check out Mahindra e2oPlus car. It is not just an electric car but more than that, with a host of features and advanced technology. (The above prices are Ex-Showroom). Mahindra e2oPlus gives 110 Km of range on a full charge for both the P4 and P6 variants. Regenerative Braking: Whenever you press the accelerator, you are utilising the electrical energy from the battery. 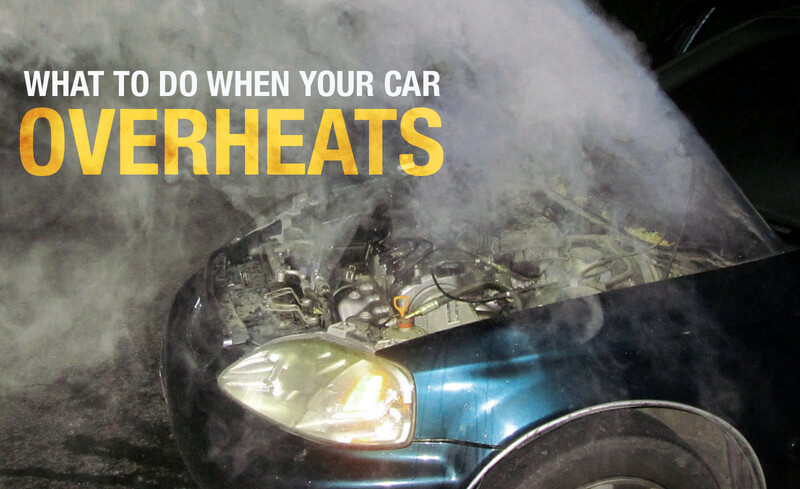 When your accelerator is not in use or at the time you hit the brakes, your car’s kinetic energy is converted into electrical energy that is responsible for charging the battery. Normal charge: Similar to normal charging, equipped with a port installed at home, workplace or charging station. 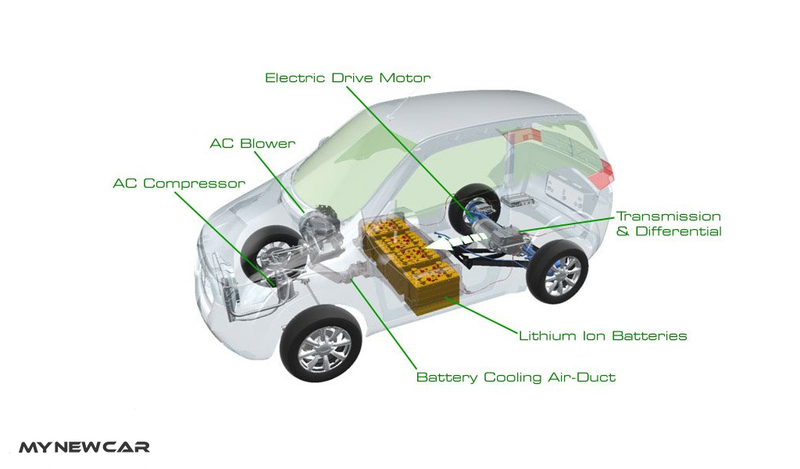 In this type, the complete charging time is dependent on the drive train capacity of the car. 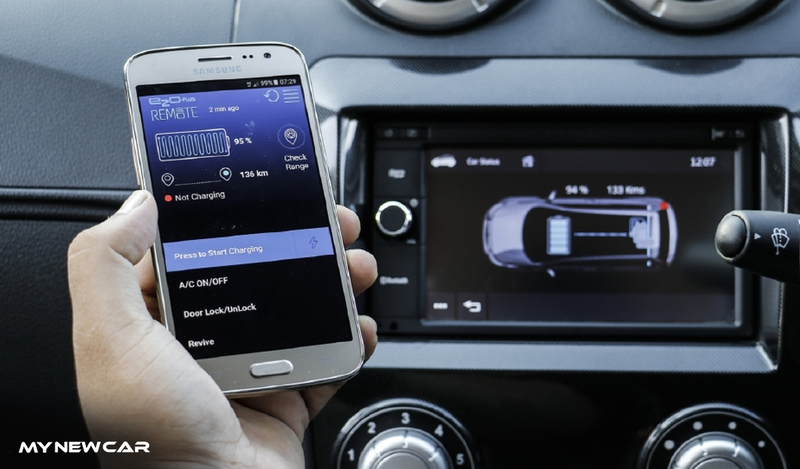 Quick2Charge: This is an innovative technology that charges the car quickly in just an hour, but the cost is more. In this case, the complete charging time is dependent on the car model. Mahindra recommends to plug in your vehicle overnight for a full charge once in 3 days to maintain the battery health as well as complete battery equalization during the charging process. All the Mahindra EVs have been designed in such a manner that they stop charging once the vehicle is fully charged. Instant Torque: This is what all the EV owners enjoy. This feature helps you to leave behind the traffic when the traffic light becomes green. This is because of the absence of engine and related parts having momentum. Thus, there is no power lag and you get instant torque at the moment you start your vehicle. iEMS: This feature helps to share your car’s health report with the expert team at Mahindra and take preventive measures against any future problems. Cost Effectiveness: The estimated running cost of e2oPlus turns out to be just 80p/km, beating nearly every car on the road. Cheaper Maintenance Costs: As e2oPlus is purely electric and devoid of an engine and other moving parts, the probability of parts failure is drastically reduced. Also, lesser spares are needed in comparison to a conventional car. Colour Impregnated Body Panels: The panels of e2oPlus are made up of multi-layer composites impregnated with the car’s body colour. The paint process used for e2oPlus is different from the regular one and that means the use of chemicals and harmful gases is phased out. The electric motor of e2oPlus produces 19 KW or 25.5 BHP at 3500 rpm and 70 Nm of torque at 1050 rpm. 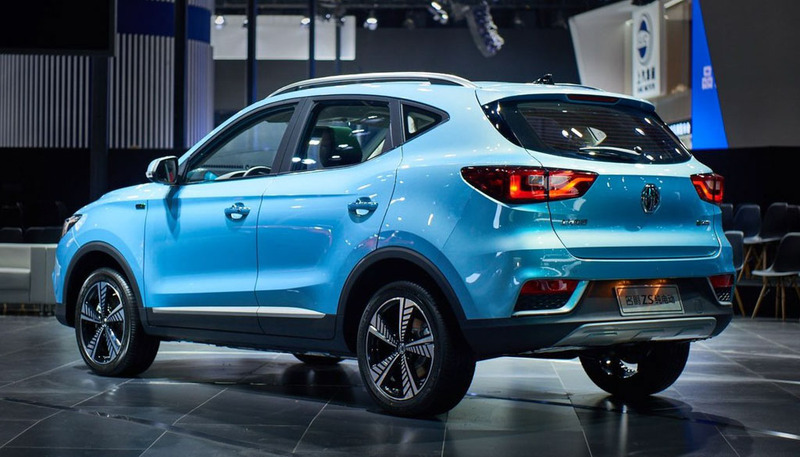 You can enjoy instant torque as soon as you press the acceleration pedal, thus a great asset if you drive in stop-go traffic that we often see in congested cities. e2oPlus achieves 0-60 kmph in 14.1 seconds, with the top speed limited at 80 kmph. Petrolheads might not find the performance of e2oPlus very satisfying, given its limited capabilities. The ride quality is decent, as the e2oPlus negotiates the smaller potholes and bumps with ease. When driving on larger obstacles, the thudding sound is audible in the cabin. Steering is electric and provides low feedback, this issue will most probably be felt during parking. 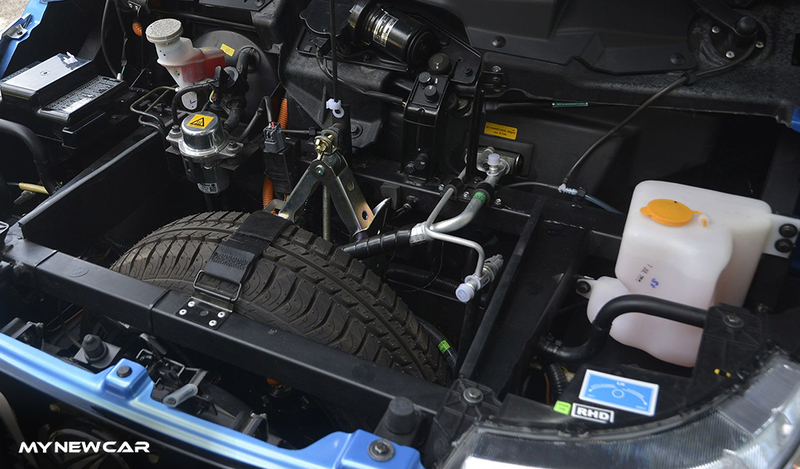 Being an electric car, the e2o does not get any engine. Instead, it gets a Li-ion battery with a capacity of 210 AH. The battery can be charged in 7 hours 20 min (using 3 kw single phase 16 amp charger) and 1 hour 35 min (using 10 kw 3 phase 32 amp charger). The battery weighs 84 kg and consists of 48 cells, and 16 modules, combining together to produce 15 KW/hr on-board power. 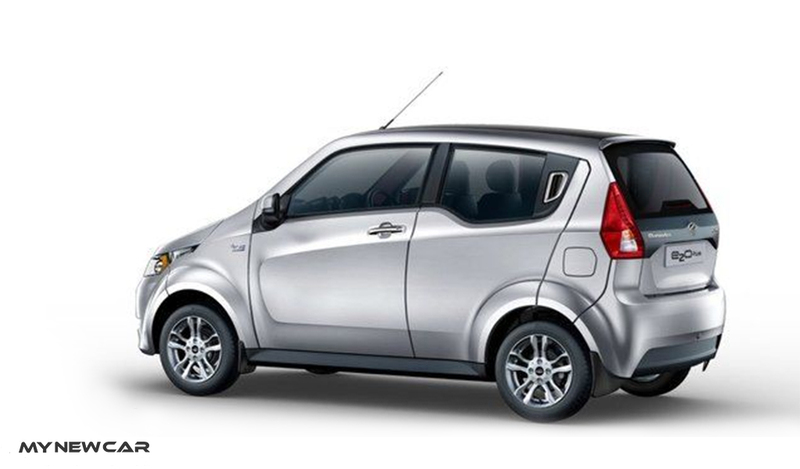 The e2o has Direct Drive Transmission i.e., there isn’t any conventional gearbox and thus no clutch. The gear lever can be slotted into four positions: F (Forward), Neutral (N), Reverse (R) and Boost (B). You will get the real joy of driving your e2oPlus, only in the Boost mode. The car when slotted into Forwarding mode, takes a little bit of time to get going. A major upgrade from Reva electric car in terms of design, performance, range and a transformation from 2 seaters & 2 door type to a 4 seater & 4 door hatchback. Very few improvements over e2o. 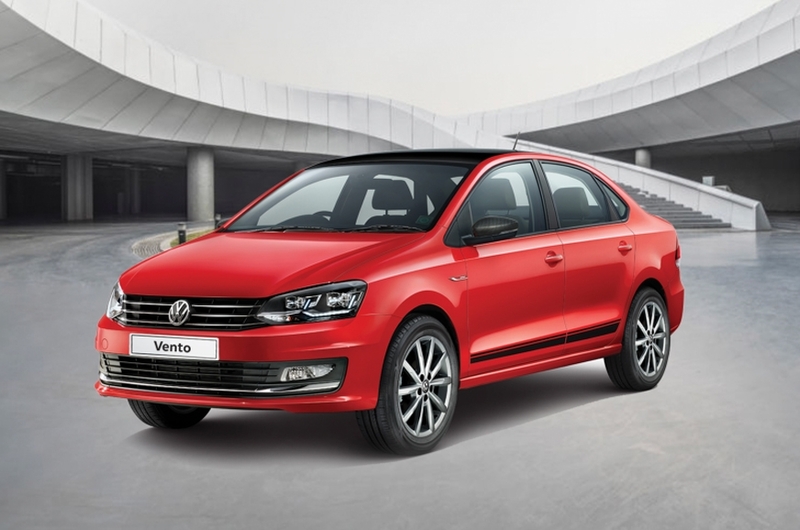 Compact dimensions and low turning radius makes it easy to drive through the city. Smartly laid out cabin. Kneeroom, as well as headroom, see improvement at the rear. 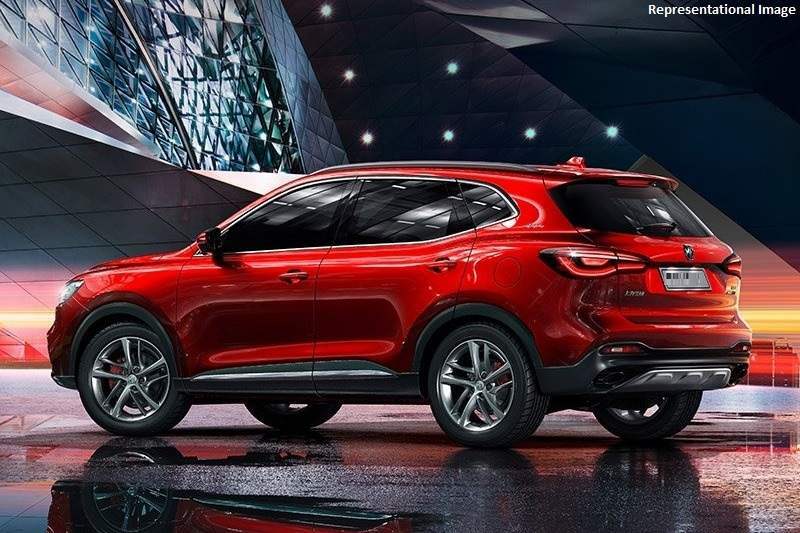 Many advanced features such as regenerative braking, smartphone connectivity, easy charging, REVive, reversing camera, instant torque, iEMS, safe mode and colour impregnated body panels have been provided. Currently enjoys the benefit of extremely low competition from other electric cars, very few options for the EV buyers. Environment-friendly helps save the planet. Does not produce any tailpipe emissions and has a very small carbon footprint. The price feels a bit exorbitant, especially for a small sized hatchback. Lower range limited to city drives. There is a lot of scope of improvement here. 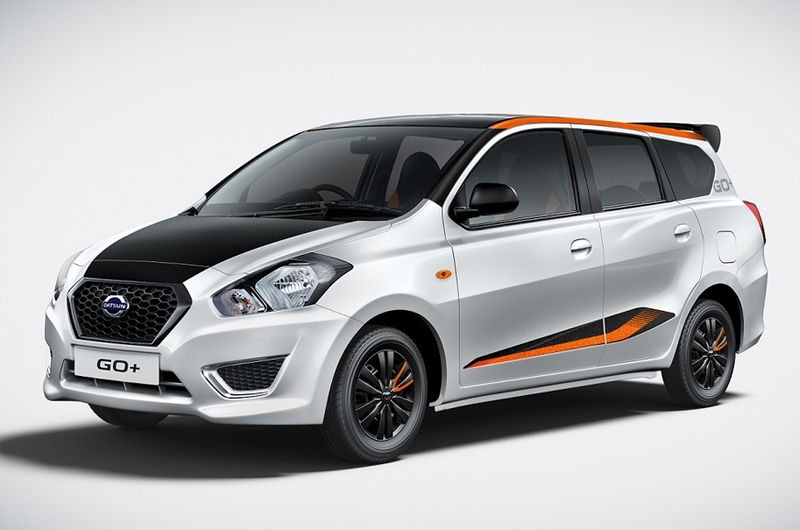 Hatchbacks at this price point are all 5 seaters. You can even get compact SUVs and compact sedans at this price point. Requires charging points in parking areas. Top speed of just 80 km/hr. Let us see what the existing owners have to say about the Mahindra battery car. 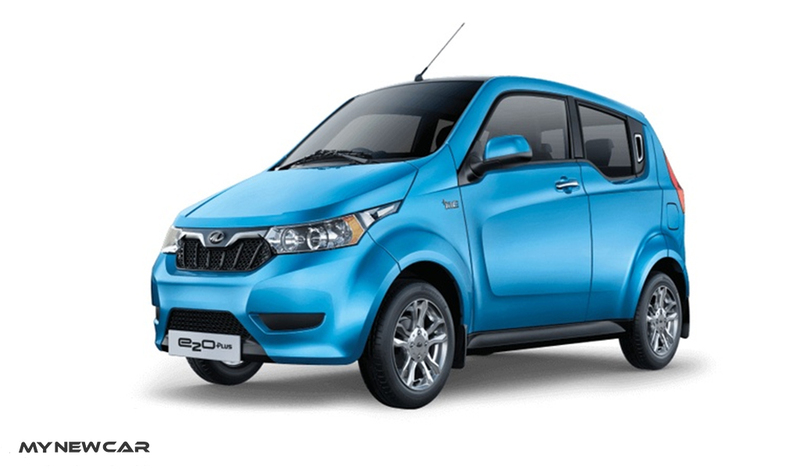 "Mahindra electric vehicles complete 10 crore kms – New app launched"
The e2oPlus borrows some of its design elements from the Mahindra family. There have been slight improvements in the design that has been carried over from Mahindra e2o car. The front grille looks very nice and matches with the overall design. There is a kink that has been provided on the window line to make the design more appealing. Halogen projector headlamps are swept back to make the design look sharper. The e2oPlus does not get any alloy wheels but only steel rims with silver wheel caps. +mE badge with a touch of blue look very refreshing. The mirrors have black inserts at the bottom. The e2oPlus does not get body coloured door handles but just bland black door handles. 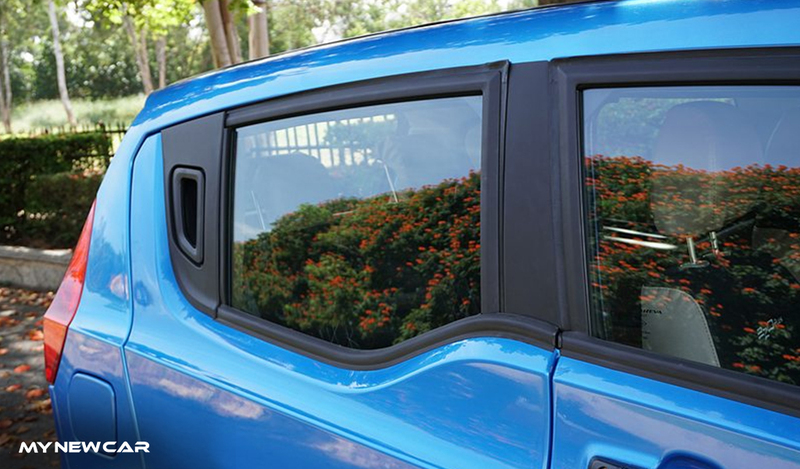 The rear door handles are located at the C-pillar. The rear follows the convincing design language with a dusky black finish insert having Mahindra and e2oPlus badge. Vertical headlamps also look refreshing. Overall, the e2oPlus looks like any other hatchback. Being electric does not make it different from other hatchbacks. 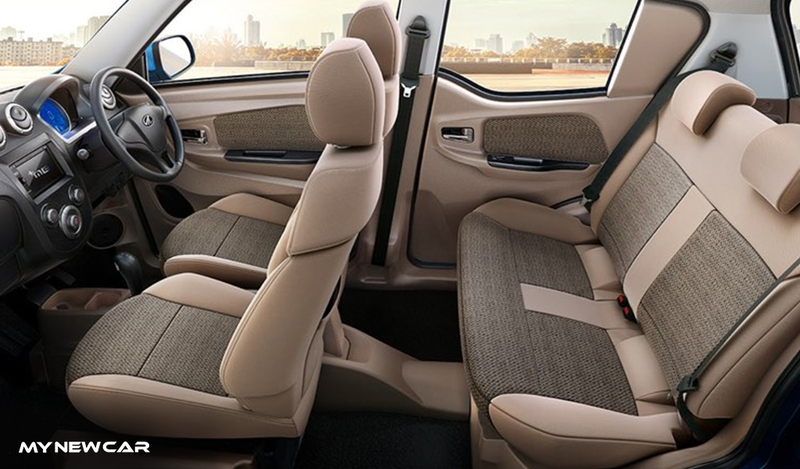 If you have stepped in the 2 door Mahindra e2o car, you could easily make out the improvement in the cabin space, especially at the rear. Two adults sitting in the back will surely feel at sea during their journey as you get ample knee room and headroom. 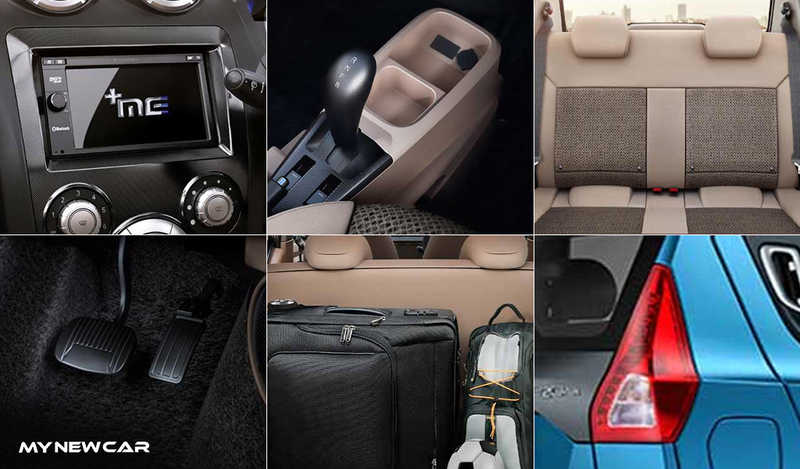 135 L boot space is sufficient enough as this car is meant only for city driving. e2oPlus gets a well laid out and practical interior. The digital console displays various information such as battery charge status, gear shift indicator, speed, distance travelled, driving efficiency, distance to empty, door open warning and seatbelt fastening warning. The steering wheel does not have any mounted controls. e2oPlus gets power windows, start-stop button, and electronically adjustable ORVMs. 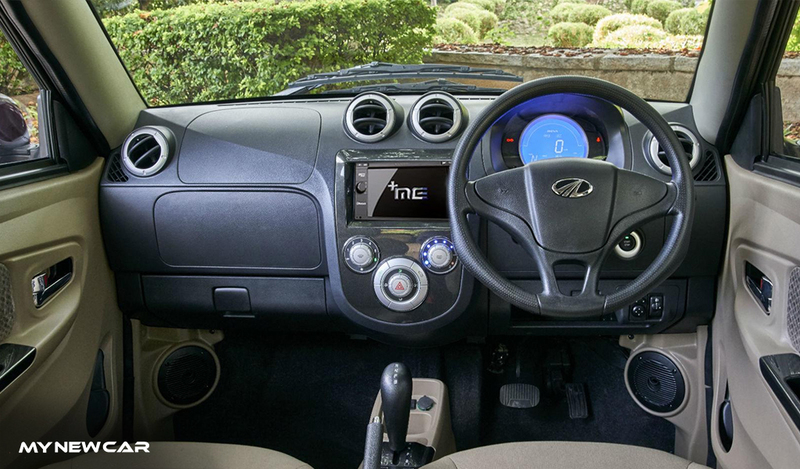 The Android based touchscreen infotainment system supports navigation, Bluetooth and information related to e2oPlus. Ports have been provided for USB and AUX. A 12 V charging socket has been provided. A small cup holder has also been provided near the gear lever. The gear lever has a Boost mode to provide sudden acceleration, useful while overtaking. The glovebox is not very deep. Frankly speaking, the overall part quality is not very convincing. Mahindra e2oPlus might not be the perfect hatchback but it is the only green hatchback that is available in India. 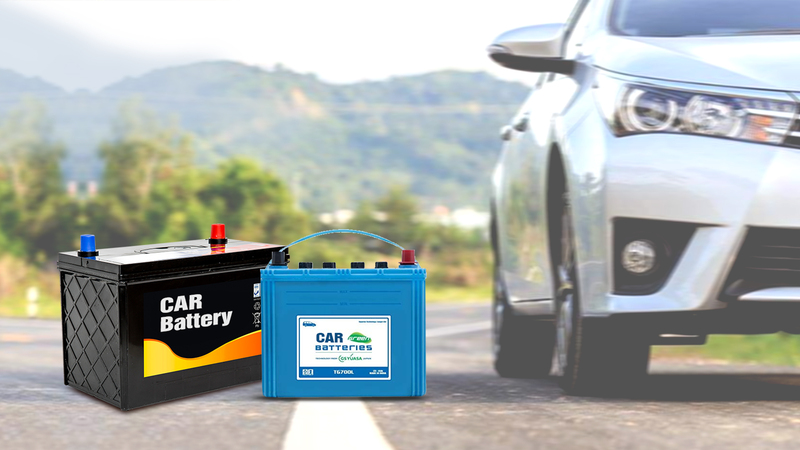 Loaded with lots of advanced features, this Mahindra battery car might tempt you to buy it but it comes with an expensive price tag, that is something you will definitely need to think about. But there is no reason not to test drive this little car. 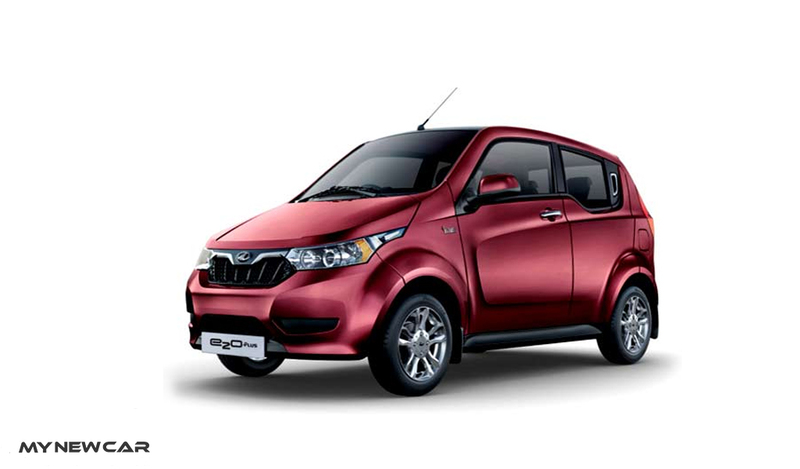 In case you wish to buy Mahindra e2oPlus, you can book it online at www.mynewcar.in. www.trivz.com is an exciting platform, first of its kind that enables you to connect with car owners for test drives as well as for ownership feedback. You can also download Trivz app from Google Play and App Store. Mahindra is a major homegrown car manufacturer and is also the third largest car manufacturer in India. The other car models available from Mahindra are:- Alturas G4, Bolero, Scorpio, eVerito, XUV 500, TUV 300, TUV 500, KUV 100, Thar and Marazzo. 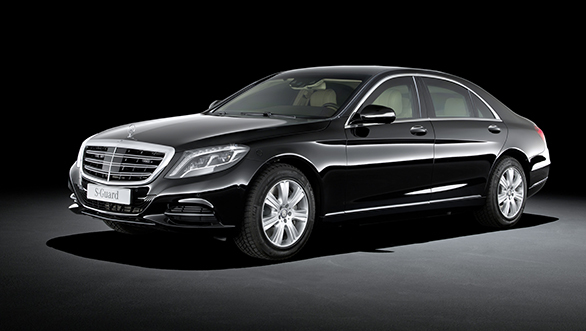 You can get more details on these models at mynewcar.in. You can check out the review of Mahindra Marazzo here. India’s largest Utility vehicle (UV) manufacturer, Mahindra has plans to launch some amazing vehicles in the first half of this year. 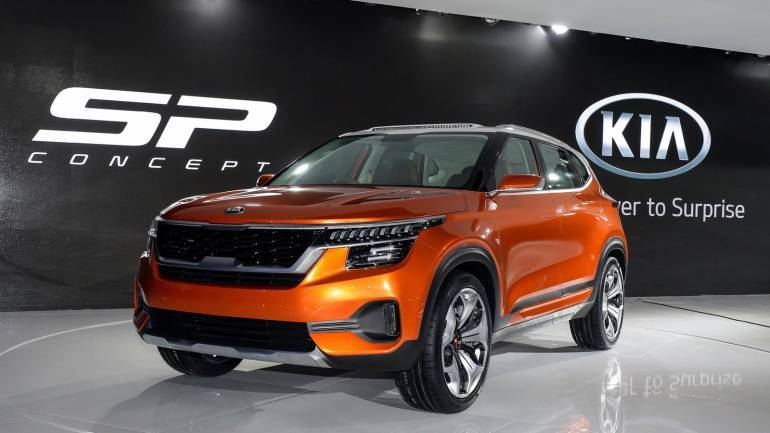 These include XUV300 (Launch date:- 14th February 2019), XUV700 or Inferno (expected launch date:- March 2019), eKUV100 (expected launch date: Mid 2019) and TUV 300 facelift (expected launch date: May/June 2019). 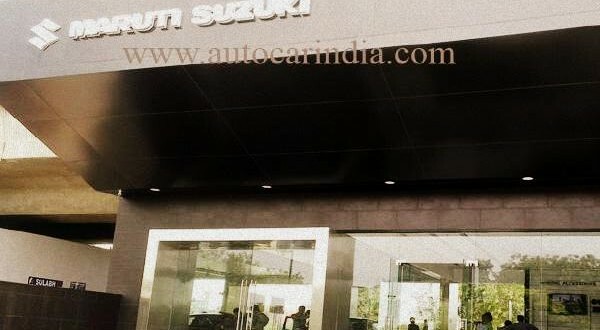 For the latest auto news, new car hot deals, new car launches and car advise, follow mynewcar.in on Twitter and Facebook.